Its construction was begun in the XIV century, its present aspect dates back to the XVI century, and it is one of the most important Gothic-Renaissance complexes in the Valencian Region. Its floor plan consists of three naves and their columns, similar to those of the commodity exchange market (lonjas) of Valencia and Majorca, and can be considered to be typical of the Catalan Gothic, but perhaps here they take on a greater degree of monumentality. 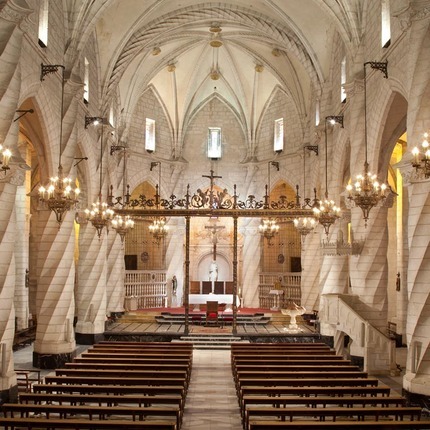 At the end of the XV century, under the patronage of the illustrious Medina family of Villena, an enlargement was undertaken which was to take all of the XVI century to complete, introducing at this time the most outstanding Renaissance elements of the church, such as for example the door entering into the sacristy and the chapterhouse, the baptismal font and the two windows on the first floor of the tower, all in the Murcian tradition and attributed to Florentino and to Quijano. The remains of a grille which was worked in 1553 stands out at the foot of the altar. On the outer side of the wall of the apse two marks were engraved at a distance from each other corresponding to the measure of the tahúlla. This Church was declared National Artistic Historical Monument in 1931. Visit: With ticket. 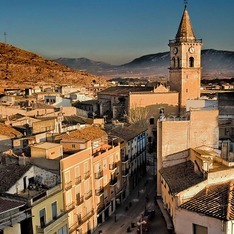 Check prices and schedules in tourist office of Villena.